Lela, daughter of Walter J. and Fannie Gray Moore, was born 6-9-1910 and died 12-24-1969.She worked in a hosiery mill for many years. Lela married Ralph Chambers 7-4-1907/10-24-1987. Their children are: 1. Glora born and died 3-15-1932, 2. Betty Jean was born 6-22-1933. Betty Jean first married Elijah Kendrick born 3-5-1928. Betty Jean and Elijah had three children; (1) David E. Kendrick born 4-21-1949 married Ann. They have three children; (a) Michelle born 2-17-1969 married Jonathon Cline 10-8-1967, (b) David 7-17-1973 and (c) Amanda 1-4-1977. David E. then married 2. Cynthia born 9-19-1955. Betty Jean married 2. G. G. Walters 1-18-1932/5-19-1985. They had two children. 1. Rita J. Walters born 5-21-1951 married Tommy Evans 11-4-1947. There is one son Joseph (Joey) Evans 1-27-1979. 2. Joyce Walters born 9-29-1952 married Donnie Houston born 11-8-1951. They have one son Christopher Troglin born 2-23-1973. Betty Jean Walters married 3. Roy Cheatam 3-3-1929/1-19-1985. There is one daughter Wanda and two sons, Michael and Rex. 1. Wanda Cheatam born 11-1-1955 married Wayne McMillian born 2-11-1957. Their children are Christy McMillian born 7-19-1975, Lee McMillian born 4-18-1980 and Dustin McMillian born 3-28-1983. 2. Michael Cheatam born 8-28-1962 married Beth born 2-11-1966. 3. Rex Cheatam born 10-22-1963 married Rhonda Hunter born 7-16-1965. Rex and Rhonda are parents of Jonathan born 12-4-1984. Bonnie lone Moore born 6-7-1911 to Fannie Gray and Walter J. Moore. She grew up at New Salem and attended school in Dade County. She worked for Miller Smith Hosiery Mill in Chattanooga, TN. Bonnie was married four times: 1. 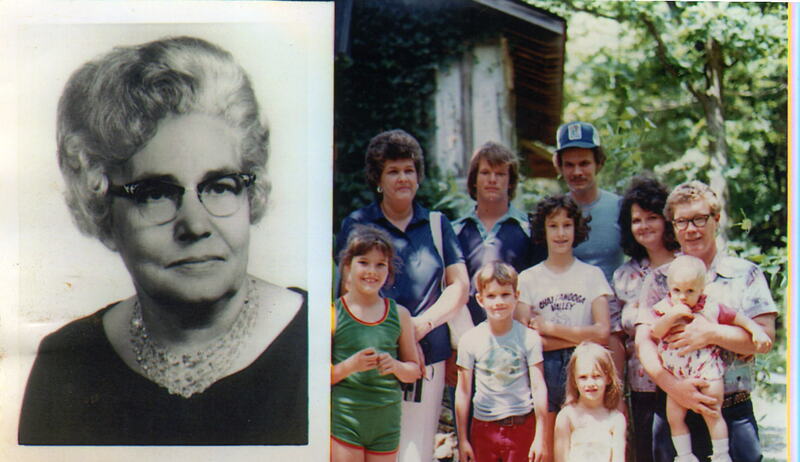 Borden Chambers – They had one daughter Betty Joyce born and died 9-21-1935, 2. Frank High, 3. Carson Cook, and 4. Andy Tallent. She died 12-31-1985 and is buried in Hawkins Cemetery at New Salem.